During the 2018 school year, Undergraduate Research Apprenticeship Program (URAP) participants Allison Joanna Lewis and Isabella Noel Nemer not only conducted research in a university laboratory – they also had their research published in Frontiers for Young Minds! 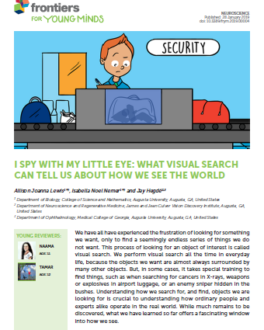 Over the course of their work, Lewis and Nemer worked with their mentor, Associate Professor Jay Hegde at Augusta University in Georgia to examine how vision works, focusing on how humans search for and find the objects they look for. Their research is crucial to understanding how both ordinary people and experts – like TSA agents, doctors or soldiers – operate in the real world. In their studies, Lewis and Nemer investigated something called “visual searching,” which is how the brain finds what it’s looking for. They focused on things like perception, which parts of the brain activate and how damage impacts otherwise common abilities. The apprentices were part of every aspect of the research from writing the manuscript to obtaining copyright permissions. Both are undergraduate students at Augusta University and, through URAP, conducted this research in Dr. Hegde’s lab. Check out their research, here! 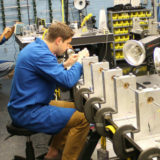 At the Undergraduate Research Apprenticeship Program, students work alongside university researchers for an authentic science and engineering experience sponsored by the Army Research Office.